With long hours, the job description is not ‘like a country club,’ Kyle Whittingham says. 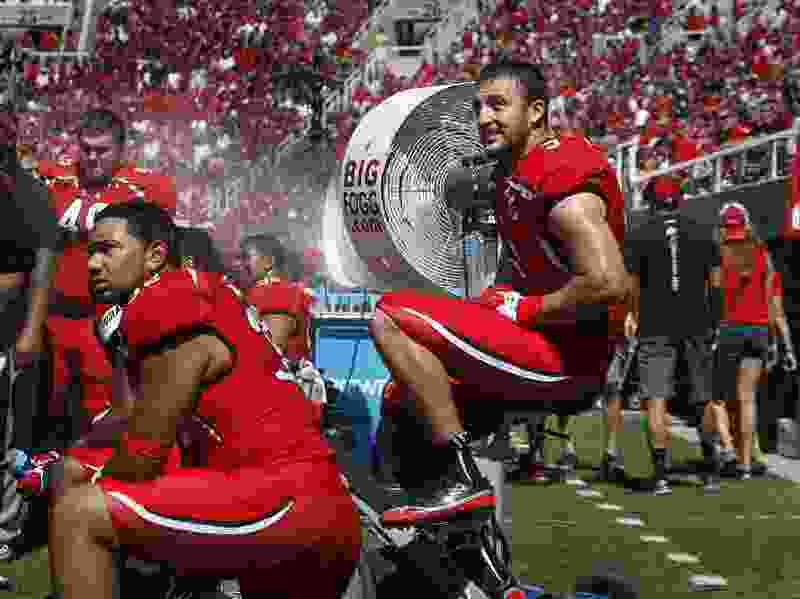 Scott Sommerdorf | The Salt Lake Tribune file photo Utah Utes defensive end Trevor Reilly (9) loosens up on the stationary bike while the offense works in the first half. Utah cruised to a 49-0 halftime lead over Weber State, Saturday, September 7, 2013. No wonder Trevor Reilly waited five years to tackle this class. The ex-Ute linebacker is back on the campus this month, working with the football program as a student assistant while awaiting an NFL team’s call. Reilly joins former teammate Brandon Burton, a graduate assistant, as NFL veterans getting their first coaching experience — and discovering there’s much involved in the profession than they may have known. “They realize that their life as a player's pretty easy, in a lot of respects,” said Ute coach Kyle Whittingham. Needing only that last class to complete his degree, Reilly called Whittingham this summer and offered to help. As a student assistant, he’s allowed to coach on the field — unlike administrative aides and recruiting staff members. Reilly accompanied the New England Patriots to the Super Bowl in February as a practice-squad player, concluding his fourth pro season in a career that has included 37 games for three teams. Backgrounds of Utah’s graduate assistant coaches: Brock Bandur, Nebraska student manager. Chad Bumphis, Mississippi State receiver. Brandon Burton, Utah defensive back. Adam Fry, Chico State pole vaulter. Trevor Reilly (undergraduate), Utah linebacker. At age 30, living in Lehi with his wife and three children, he may or not get another NFL shot. Even if a call came, Reilly said, he would have a decision to make. “I'm all into the coaching thing right now,” he said. Reilly, who's helping coach the offensive line and special teams, is remembered as an aggressive defender and team leader whose interception clinched a 2013 victory over Colorado in his final Rice-Eccles Stadium appearance. He famously heaved that football in the stands. Burton also made a memorable play in the south end of the field in his last home game as a Ute, blocking a field-goal try to preserve a 17-16 win over BYU in 2010. Burton’s successful dive launched Utah’s seven-game winning streak in the series. Burton, 29, had not considered coaching until that moment. But he visited practice and ended up becoming one of the Utes' four graduate assistants in 2018. “I fell in love with it, so I'm definitely on the track to coaching,” said Burton, who's working with the cornerbacks, the position he played.